Over the years I have published interviews with new members of TSIA’s Partner Advisory Board. I had some time this week to chat with one of our newer PAB members, Duncan Heal, Managing Director and CEO for MARKETii, about industry trends around voice of the customer programs. With Duncan’s permission, I’m sharing our conversation with my blog readers. Enjoy! John Ragsdale: Duncan, thank you so much for agreeing to participate in TSIA’s partner advisory board, and thanks for making time to talk to me today! Duncan Heal: My pleasure and thank you and TSIA for asking me to be part of the board. John: Market Intelligence International, or MARKETii, covers a lot of territory related to Voice of the Customer programs. Can you give us a quick overview of your services and programs? John: In addition to all these customer facing programs, you also offer a program on employee satisfaction. I’ve seen a lot of survey data that the first step in having happy customers, is making sure you have happy employees. How do you work with your customers on measuring employee satisfaction, and what do you see them do with the data you provide? John: I’ve gotten in trouble a few times for comments I’ve made about Net Promoter. My issue is that companies that only ask one survey question a year, of one account holder at the customer account, are not getting a full view of that customer and their experience. I know you do a lot of Net Promoter work with your customers. Can you comment on how you recommend Net Promoter should fit into the overall satisfaction, loyalty, or VOC program? Or do you think one question a year of one person at the account is enough? John: MARKETii was a finalist last year for our TechBEST Best in Satisfaction award, for having one of the 3 highest satisfaction scores in my annual technology survey. First of all congratulations for that—with 24 categories of tools and services, and dozens of vendors in each category, being one of the top 3 is a major achievement! How does MARKETii go about making sure your customers are satisfied and receiving value? Duncan: Thanks John. First of all we ensure we have a great team of Account and Project Managers supporting every client. We then mix in a strong element of pro-activeness that comes from our experiences in running these type of programs and projects. And I think the key element of this and something that we teach to our clients is that the relationship is key to building an understanding of needs, wants, and how the actual client operates so that we can supply the right research at the right time to the right people. We treat them how them in the same way that they should be treating their customers. John: With TSIA’s focus on B4B and the shift to outcome based services, we are seeing more interest in monitoring customer success. Our definition of customer success includes some sort of consumption monitoring to understand how customers are adopting and using your tools and services, and how much value they are receiving from the tools and services. My recent 2014 Technology Survey found that only 14% of our members are currently using any sort of technology for consumption monitoring and analytics. Are you seeing any interest in this topic from your customers? Does MARKETii see consumption monitoring as part of a strategy to improve satisfaction and loyalty? Duncan: To answer your first question, yes, we are seeing this come up. We have developed some tools that allow clients to understand the customer importance and usage of some of their services balanced against the cost/time/risk and effort from the clients perspective in providing these services. When you take into account the successful, or unsuccessful customer interaction then our Strategic Priority Analysis helps the client fully understand where they need to concentrate their efforts and to understand what is successful. This does lead well into the 2nd question you asked John in that by companies better understanding the way they deliver the services and the impact it has on customer satisfaction and loyalty then these companies are in a better position to adapt their services quicker and have more consumption based services. A good example is the way that companies are looking to Marketii for more subscription based and adaptable services for monitoring their customer satisfaction purely because they are adapting, improving and changing their own offerings. John: I’ve started receiving more inquiries just recently about monitoring social media channels to help identify key influencers of your brand, and to better measure customer sentiment and identify areas for improvement. How important is social media monitoring to your customers, and is this a growing area of interest? Duncan: John, it certainly is becoming more important . I think the users and customers in B2B or should I say B4B markets and organisations are a bit different to the B2C customers in their use of social media in terms of influencers of a brand. What I mean is that a consumer buyer being much more likely to tweet about their experiences of, say, a restaurant or some new clothes, than that of a consumer of IT systems or CRM tools. That is not to say it isn’t growing, but it is done in different ways. Market ii and Market ii Medical carry out research into the “tipping points” or “tolerance levels” of customers at which they will go onto social media and write about the brand or issue. This is done to gain a much better understanding of the combination of when that is, and what is the caused. Companies are then able to prevent the issues from occurring and understand the customer issues better before they start to move to social media to potentially damage the brand. Thinking about what you said about sentiment analysis, this can be looked at in two ways. One, there is the overall sentiment in the feedback from customers that we turn into dashboard reporting, thus giving a view of customer satisfaction levels leaning one way or the other. The real nuggets of information come in the coding of open narrative to assess areas of improvement and importance. We work really hard to ensure that when looking at as an example a pie chart of what area to improve upon you don’t see a large pie slice saying “other”. That is no good to the client. The better coding and analysis of the narrative gives the client a complete picture of where to concentrate their efforts and doubly so by being able to understand if those things that need improving or maintaining are of importance to the customer. John: I know you work with a lot of different industries, including a new MARKETii Medical division. It seems the stakes can be pretty high in understanding issues with customers in the healthcare and med tech industries. What are some of the unique challenges these companies are dealing with? Duncan: First, we are very excited to announce our new division, Marketii Medical. We saw a distinct need in the medical device marketplace for a Customer Experience company who was strictly focused on helping medical device companies build customer loyalty. Medical devices is a very competitive market place. There are new players coming into the market on what seems like a daily basis. What we are finding is that the vast majority of companies are seeing that service excellence and not product is driving customer loyalty and profitability. Also, service costs for medical device companies are among the highest in the industry, so it is critically important to measure and track satisfaction with service provided to help keep these costs down. Evans Manolis is the President of Marketii Medical and he brings with him over 16 years of experience and has worked with over 100 medical device companies during that time. John: Duncan, thanks for taking the time to speak with me today! Look forward to seeing you in Santa Clara for TSW! Duncan: Thank you John, good to talk with you and look forward to catching up in a couple of weeks. Take care. Thanks everyone for reading! You can meet Duncan and learn more about MARKETii at our Technology Services World Conference kicking off May 5th at the Santa Clara Convention Center. Hope to see you there! I Know Social Media. What the Heck Is Social Support? In Theatre One at 12:20, we have this presentation by Jive Software: The term Social Media gets tossed about a lot these days. So, what is Social Support? At Jive, it includes Social Media, of course, but it’s much more than just monitoring Facebook and Twitter. True Social Support means meeting your customers where they are, even as their support expectations evolve and change. Doing this well equals meaningful ROI in case deflection and improved customer impressions. We’ll define the key deltas between social media and social support with a framework to understand which will delight your customers. We’ll also discuss effective ways to bridge the two and share results from businesses succeeding at this now. Also learn to imbue your brand’s messaging into your social responses, with emphasis on reaching Millennials. Customer Care is now social. Join us to discuss a strategy to make you successful. Presenter: Tim Albright, Senior Director Community Strategy, Jive Software, Inc. Innovate in Customer Support: At Least Six Hard-to-Fix Needs Satisfied Through One Solution. In Theatre Two at 12:20 we have this presentation from Sykes Enterprises: Great support is what your users expect. Delivering this and successfully handling the multiple, and often opposing, goals of maintaining high quality while minimizing waste, managing costs, increasing access, and remaining flexible, agile and relevant is what your business really needs. Virtual Contact Centers deliver on this by using home-based agents. Imagine if your customer support could: Meet seasonal demands without adding real estate; Barely miss a step when bad weather hits; Handle unexpected volumes within minutes/hours instead of days/weeks; Match agent knowledge/experience to customer needs/interests in their own area; and draw on skills and abilities from virtually the entire population of North America. Your speaker, Nick Sellers, TSIA Partner Advisory Board member, will: Describe how to recruit, train, manage and engage the team safely and securely without seeing employees daily; Show how the operation scales and flexes to meet changing needs; and provide examples of how regulatory compliance, security, and other requirements are satisfied. Join this session for insights into how Virtual Contact Centers are changing the way that customer support is being delivered and business objectives met. Presenter: Nick Sellers, Senior Director, Strategy and Marketing, Sykes Enterprises. Convert Stellar Service into Revenue with Enhanced Digital Engagement. At 1:10 in Theatre One, we have this presentation from LivePerson: Best-in-class companies know the secret to converting high value visitors: You need to engage them at the right moments with the right message with the right medium. Companies like Intuit are re-inventing engagement strategies by moving away from treating website visitors with a “one size fits all” approach. The secret to their success is in identifying, segmenting and targeting those who are high impact, and engage each differently to convert them into lifetime customers. With the help of LivePerson, Intuit drives product adoption by creating a customized path for their most valued customers, maximizing the customer service experience to drive revenue. Learn how to use technology to identify your most important customers and guide them through their service journey, resulting in increased lifetime value and creating brand advocates–while lowering costs along the way. Presenters: Tim Egolf, Customer Care Designer, Intuit Inc., and Alon Waks, Head of Product Marketing, LivePerson. Product Support 2.0: Addressing the Shifting Demands of Customer Support for Products and Services Businesses. At 1:10pm in Theatre Two is this presentation by Cognizant Technology Solutions: Product evolution and customer expectations on the support experience are going through fundamental shifts. As the velocity of business accelerates and products move to an “as a service” model, technical support is increasingly becoming critical to business continuity for end customers. Customers of products and services are demanding a high-quality service experience – available anytime and anywhere. Business leaders expect their customer support organization to become a strategic revenue driver rather than solely be a cost center. Further, businesses want to gain deeper customer insights to determine appropriate cross-sell/up-sell opportunities. The combination of these evolving business demands is what we are calling “Product Support 2.0.” Cognizant has a successful track record of delivering a next generation support experience across software product generations – through desktop, web, mobile, cloud models. Cognizant integrates world-class support operations with business/domain consulting, product/platform engineering, IT delivery, and analytics capabilities. Combined with our best-in-class people practices and “customer first” DNA, we are transforming support operations for our clients globally. In this session, we will share some of our best practices and approaches around “Product Support 2.0” and how you can deliver greater value to your customers. Presenters: Cary Oshima, AVP, Technology Industry Group, Cognizant Technology Solutions; and Mahesh Jadhav, AVP, Business Process Services, Cognizant Technology Solutions. Stay tuned for more updates as we get closer to TSW! And as always, thanks for reading! TSIA’s Technology Services World is just around the corner, May 5-7 at the Santa Clara Convention Center. On the opening day of the conference, we are doing a flight of Pacesetter sessions, with presenters from some of our most progressive members giving insight into successful programs. Topics include customer experience, analytics and automating service delivery. I’m hosting a session on Social Media for Support, with two Pacesetting members, Doug Pluta, Project Manager, Cisco; and Tim Lopez, Social Support Manager, Symantec. John: Thanks so much for agreeing to participate in our Pacesetter Session on Social Media in Service! Doug: Thanks for asking me John. We’re doing some exciting social media projects within Cisco’s Technical Services unit, and we’re happy to share our experiences with the Eye on Services blog. John: I’ve been reading your whitepaper, “How Cisco Services Uses Social Media Listening to Improve Internal Efficiencies and Customer Support.” Most B2B companies think that monitoring social media conversations is a marketing job, but you make a good case for why service executives should care about this too. Can you talk about that? Doug: This effort has been in the works for over two years now. During that time we’ve focused on developing a working process that includes stakeholder buy-in and executive support. Our outage and disaster monitoring initiative has been recognized by our executive team as a strategic resource that is vital to our ability to service our customers in a proactive way. The work we do with other internal stakeholders is consistently recognized as an important contributor to our ongoing conversations about improved service to our customers and Ease of Doing Business initiatives. 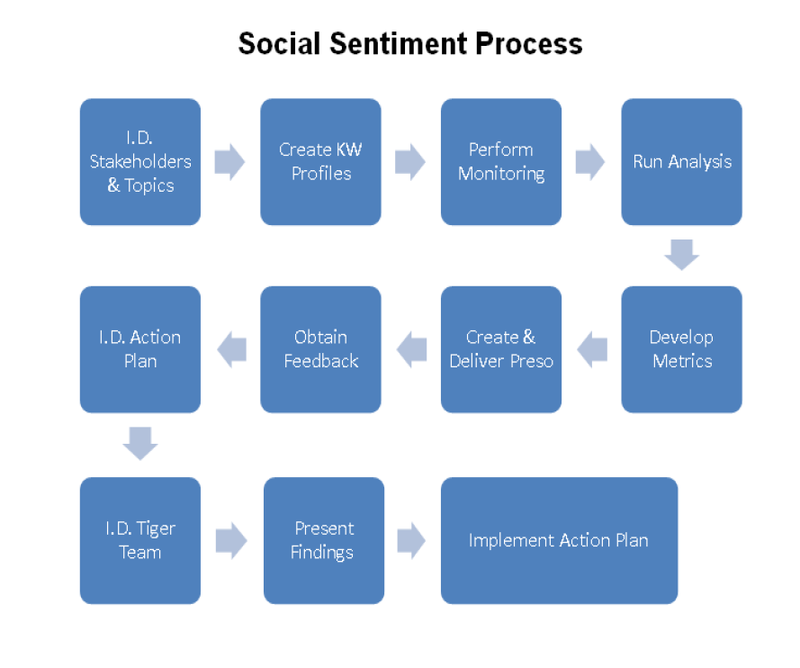 John: I’m very pleased to see you’ve actually developed a process for social listening, the “Social Sentiment Internal Engagement Process.” How did this process come about, and can you describe some of the key process steps? Doug: Cisco Technical Services has been keenly focused on enhancing internal stakeholder engagements and this includes using Social Media listening as an important data point. Initially, we did not need to seek out stakeholders. The first groups we engaged were asking for this data and the Customer and Business insight (CBI) group recognized the opportunity to provide this type of data along with traditional survey data. Social Sentiment is one of several “Listening Channels” that provides solicited and unsolicited customer sentiment data to several key internal stakeholders. Our expectation is that we will increase our stakeholder base and continue to evolve our data sets. John: In the whitepaper, you document both internal and external impacts of the program. Great to see you measuring results! Can you highlight some of the impacts for our readers? Doug: Over the last year, Social Sentiment has moved from being a data provider to also providing robust analysis. This includes more detailed information that follows the history of cases and how they were ultimately closed. For instance, we did a detailed analysis on one of our internal content developers. Their audience is significantly large and they have a direct impact on Cisco’s Technical Services unit. With the level of analysis that we provide, we can tell them the top areas of the business that are seeing more negative social sentiment and even which products are being impacted. This allows them to focus their efforts on content that is generating readership and is important enough for people to mention in Social Media. John: One of the questions I receive from TSIA members is how do you know which social channels to monitor. Do you have any guidance on deciding where to focus your attention? Doug: The Social Sentiment team gets the best data from Forums and Twitter. Forums provide us with the detailed history that we need to develop metrics that can drive action through a business unit. Twitter gives us the emotion that we need to gauge acceptance (or not) of new or existing tools and processes and of course to find out about any Twitter-based outage or disaster mentions that we can leverage to the benefit of our customers. John: Thanks for taking the time to speak with me, and I look forward to seeing you in Santa Clara! Doug: Thanks again for asking me John. I’d like to recognize my teammates Michele Budden and Angela Wilson for the cutting-edge work they’re doing within the Social Sentiment team. Thanks to the whole Cisco team, and thank to you for reading! Hope to see you in Santa Clara! Delivering Support thru Technology Skill Groups. Technical Support organizations tend to be characterized by teams with product focus, serial escalation of more difficult problems, and complex workflows. NetApp has embarked on a path to bring the appropriate level of technical assistance as close to the customer as possible while continuing to improve support efficiencies. In this session, PWC and NetApp will share an approach to achieving these goals while servicing a highly demanding, global, extremely heterogeneous customer population. Leaders and practitioners that would like to explore new ways of providing high levels of service in complex technical environments will be interested in this presentation. Speakers: Matt Stone – Director, Customer Success Services, NetApp; and David Yoffie – Customer Impact Consulting Practice, PwC. From C-Suite to Practitioner: Patheon Leverages PSA to Maintain Competitive Edge. In a global climate of outsourcing, services businesses are no longer exclusive to technology organizations. With greater emphasis on speed to market and extension of technical capabilities, one such industry moving more and more towards outsourcing is the pharmaceutical industry. However, there is one characteristic shared by all services organizations – the need to continually improve core KPI’s (revenue and margin) in increasingly competitive environments. Hear how Patheon, a global leader of contract drug development and manufacturing services leverages Changepoint to give it a competitive edge to improve efficiencies in delivery of services and profitability. Temoor Saeed, manager, Global PDS, Business Processes, discusses how Patheon, by strengthening its core operations, has deployed a strategy to drive efficiency improvements throughout its facilities, materials and supporting operations, giving it a broader solution for project delivery within its pharmaceutical development services division. Speakers: Temoor Saeed – Manager, Global PDS, Business Processes, Patheon; and Matt Weick – Director, North American Sales, Changepoint Corporation. Next-Generation B2B Online Community. If you think online communities are just discussion forums, think again. Companies like AppDynamics are stretching the boundaries of a B2B community, encompassing documentation, learning, ideation, app exchange and other elements to create a one-stop shop for sharing and learning. In this session, Steve Levine, Senior Product Manager at AppDynamics, will share the business rationale for creating such a hub and what it took to bring all the right pieces together. Joe Cothrel, Chief Community Officer at Lithium, will set the stage with some observations about B2B trends across Lithium’s global customer base. Power to the People! During an epic 15 year journey, Rackspace® has transformed from an obscure San Antonio start-up into the global leader in hybrid cloud, the founder of OpenStack®, and a constant on Fortune’s list of 100 Best Companies to Work For. The home of fanatical support, Rackspace® now operates on four continents and is helping the world through the cloud revolution. Learn how they empowered customers to guide them on this journey by combining trusted disciplines and a fiery culture, with a unique set of tools. Then get a sneak peek into the future as they share their plans for empowering front line employees to drive the next wave of innovation. Speakers: Julian Lopez – Head of Customer Loyalty, Rackspace Hosting, Inc.; and Clayton Sherwood – Business Development Director, Clarabridge. We are still finalizing abstracts and speakers for a few additional case study sessions, so stay tuned for more updates! Hope to see you in Santa Clara. And as always, thanks for reading! You are currently browsing the Ragsdale’s Eye on Service weblog archives for April 2014.